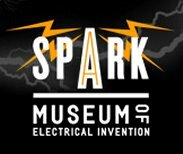 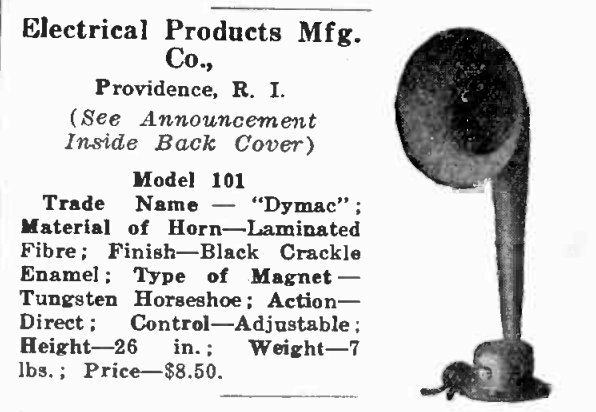 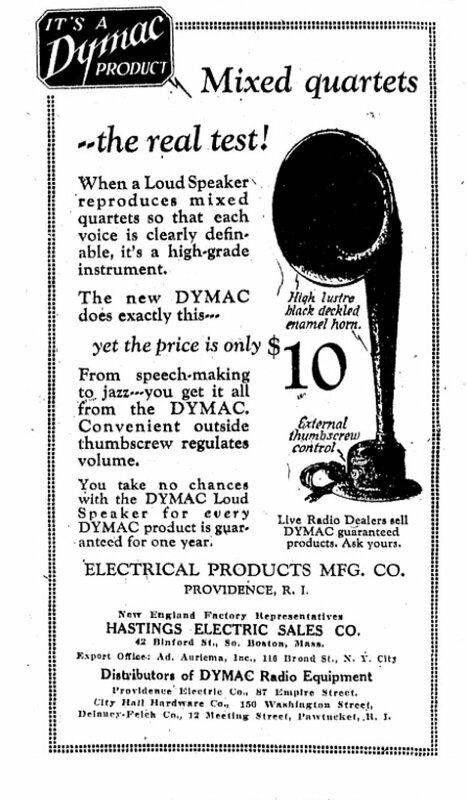 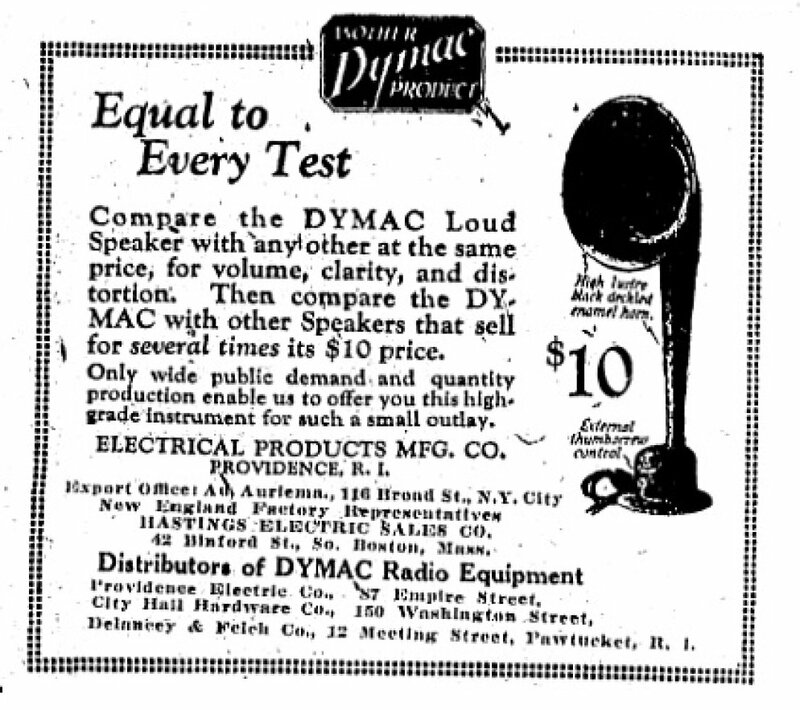 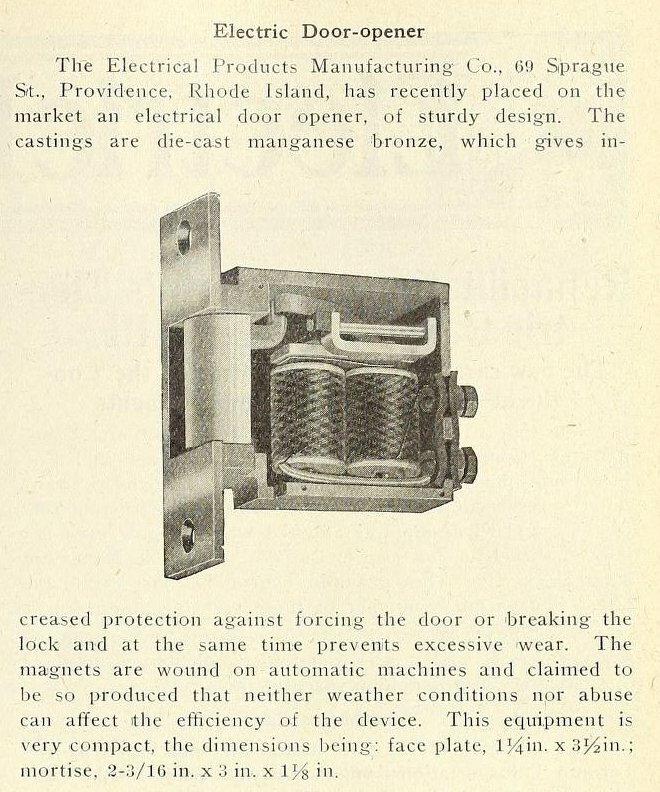 Electrical Products Manufacturing Company, 69 Sprague St, Providence, RI was established in 1919 14 . 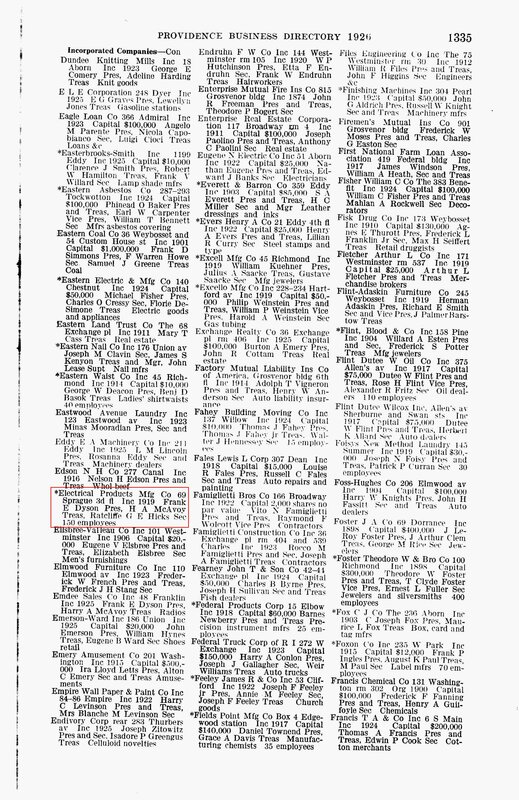 President was Frank E Dyson, Vice President was Thomas P Giblin, Secretary and general manager was H A McAvoy and Treasurer was Charles Eddy. 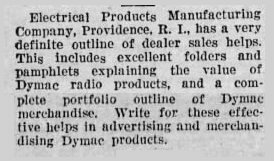 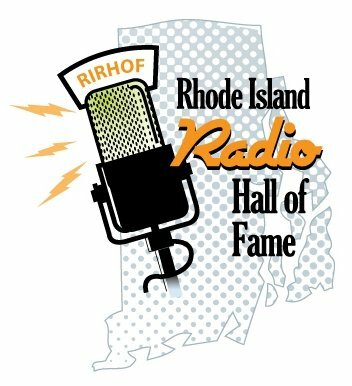 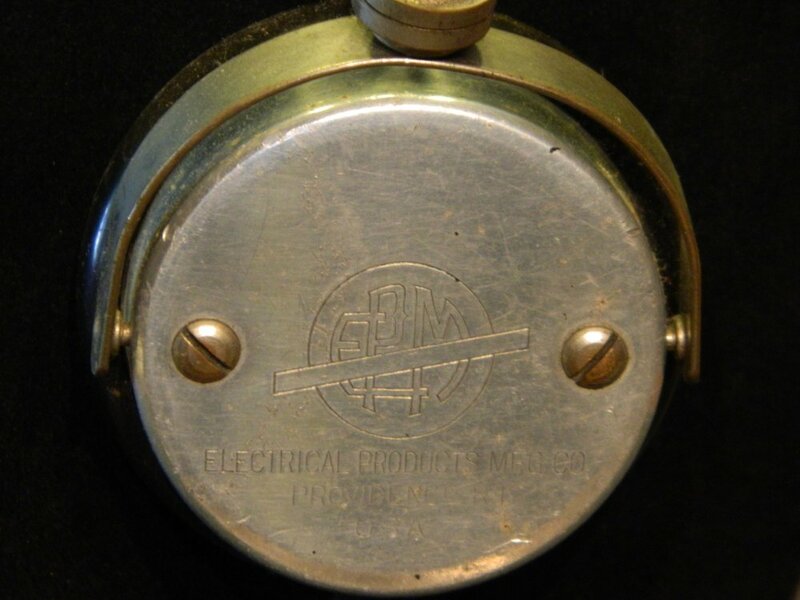 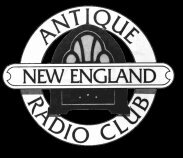 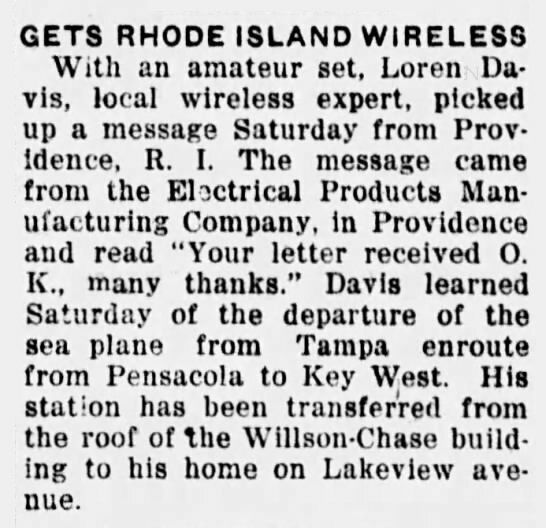 1 Frank E Dyson was also formed the Commercial Radio Company of America with Thomas P Giblin, and Ratcliffe G E Hicks 5. 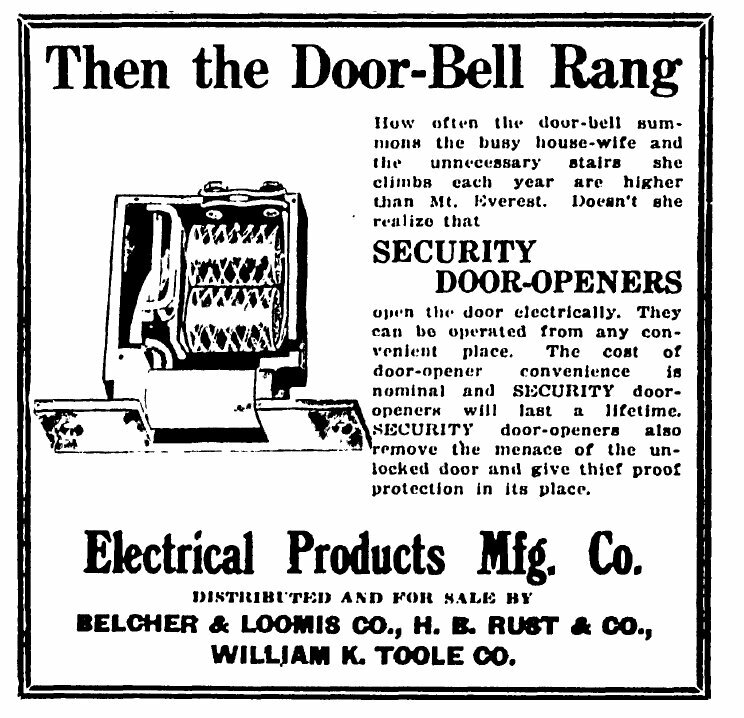 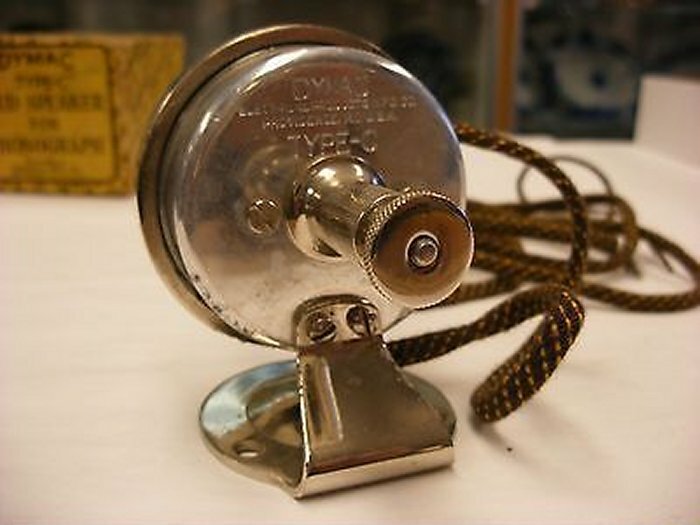 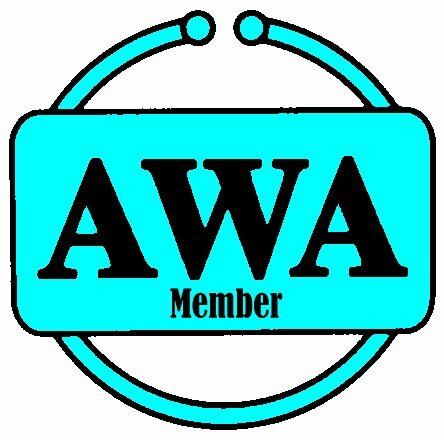 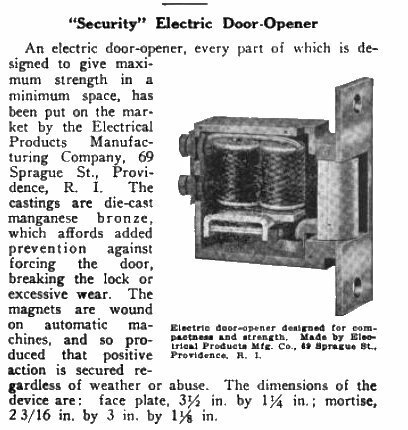 One of Electrical Products Manufacturing Company's first product was a automatic door opener. 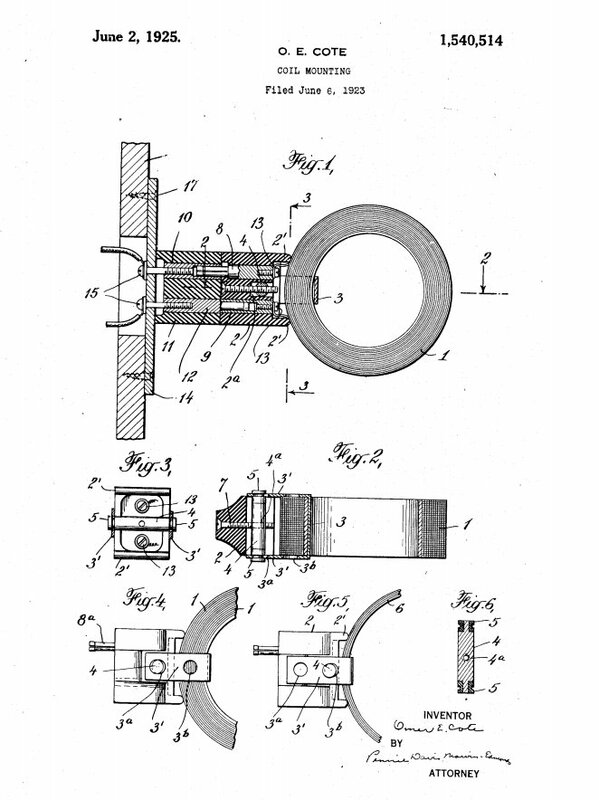 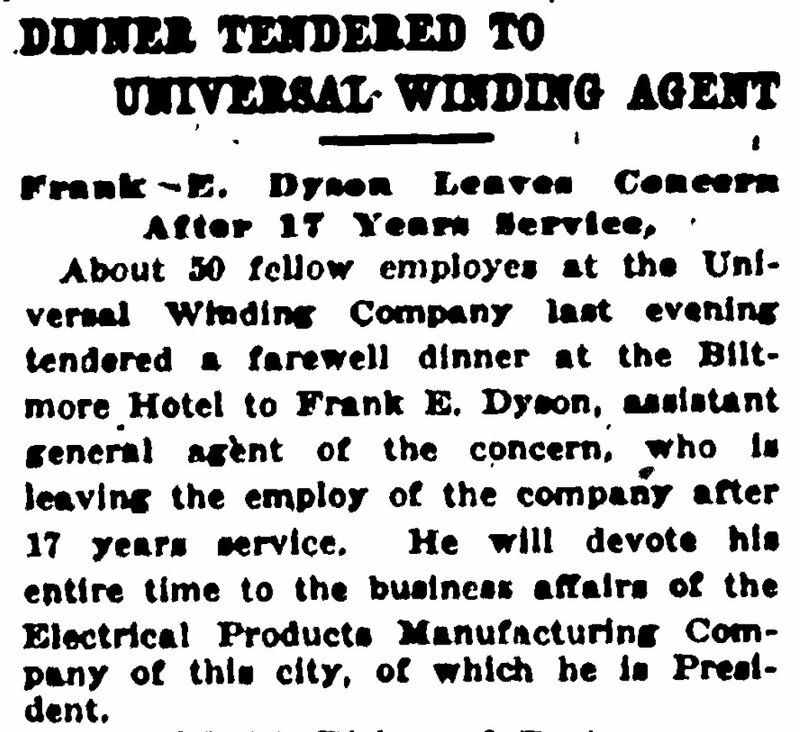 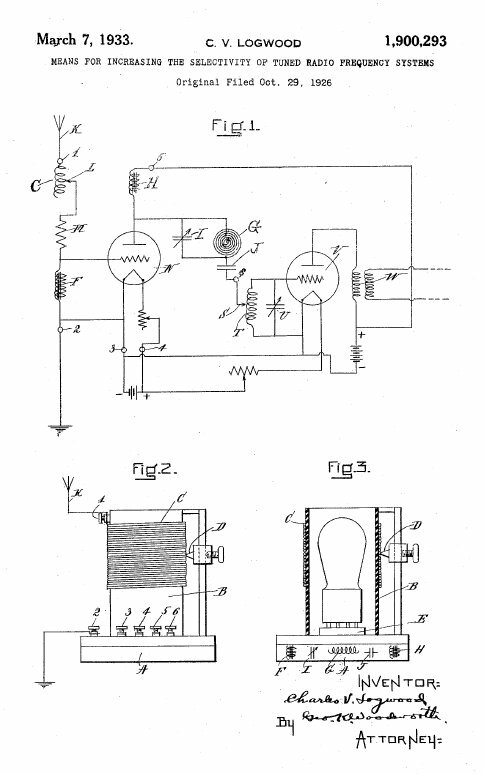 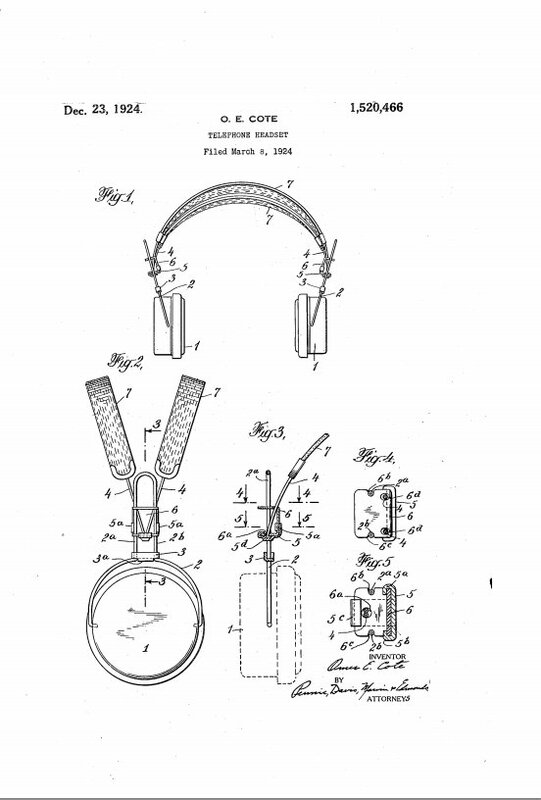 Frank E Dyson left Universal Winding in 1922 to devote his entire time to Electical Products Manufacturing Company. 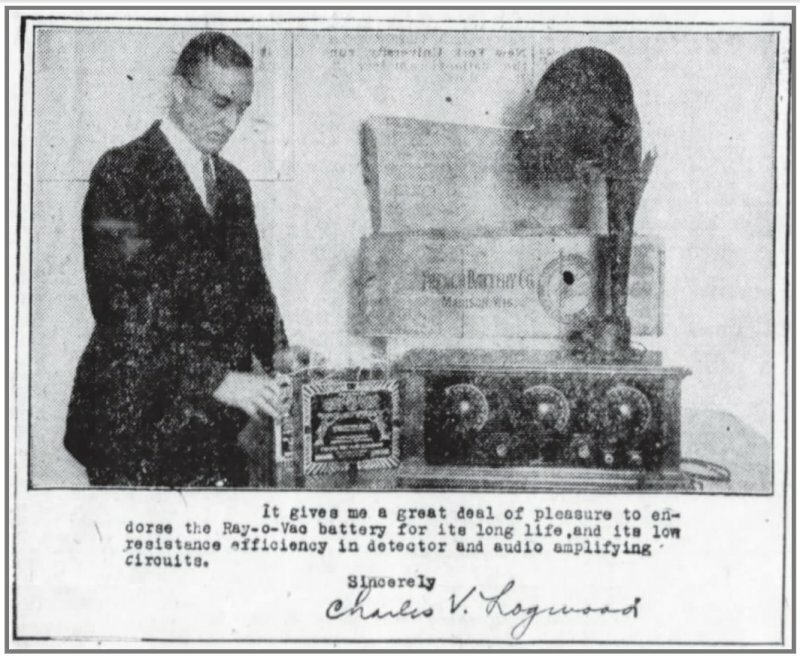 The 1923 Journal of the A.I.E.E. 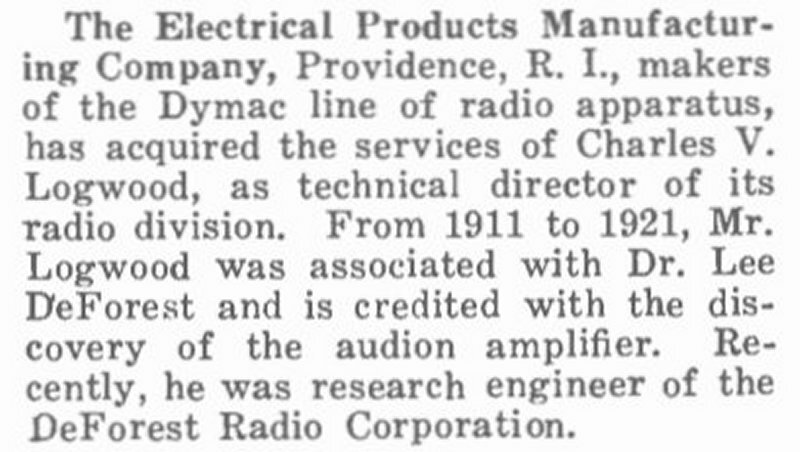 (American Institute of Electrical Engineers) lists Mr Omar E Cote as the Chief Engineer. 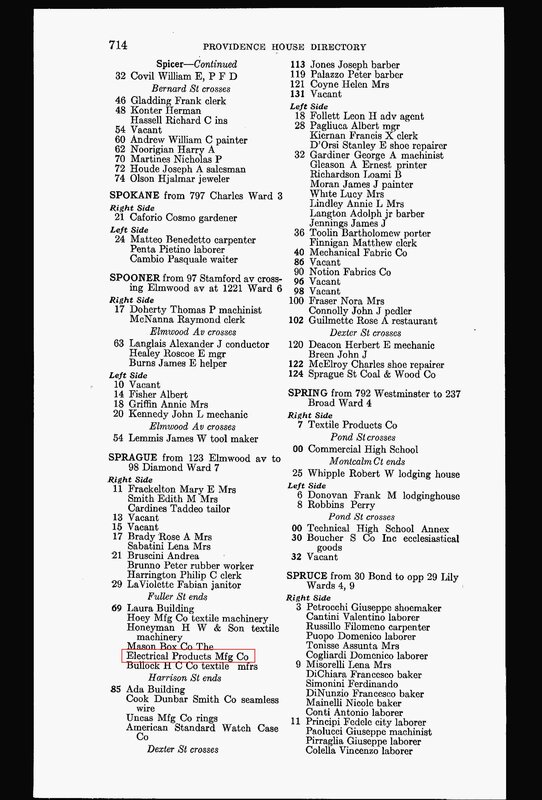 4 and their address as 69 Sprague Street 10. 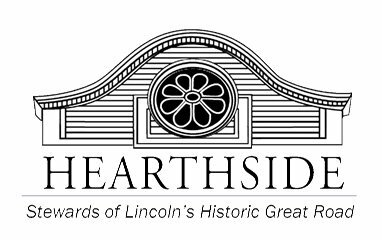 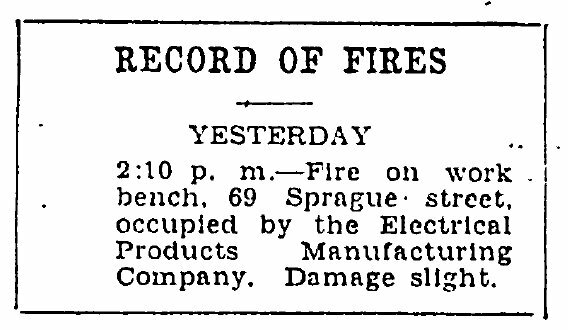 In June of 1925 there was a small fire at the plant at the intersection of Westfield and Harrison Sts. 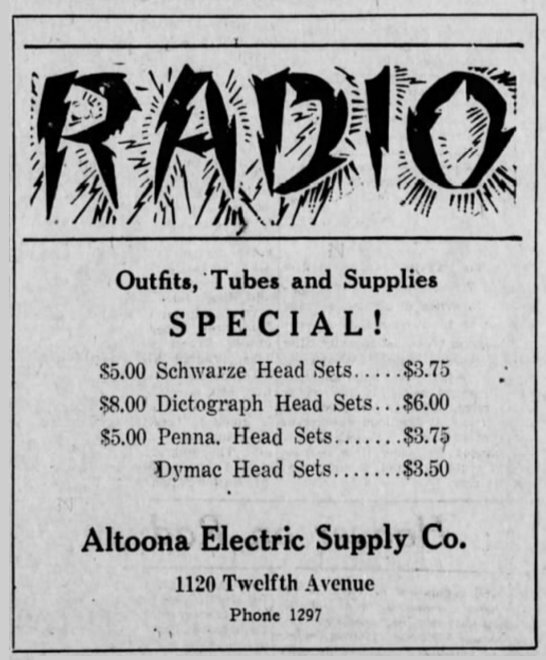 This particular address does not show up in any of their advertising. 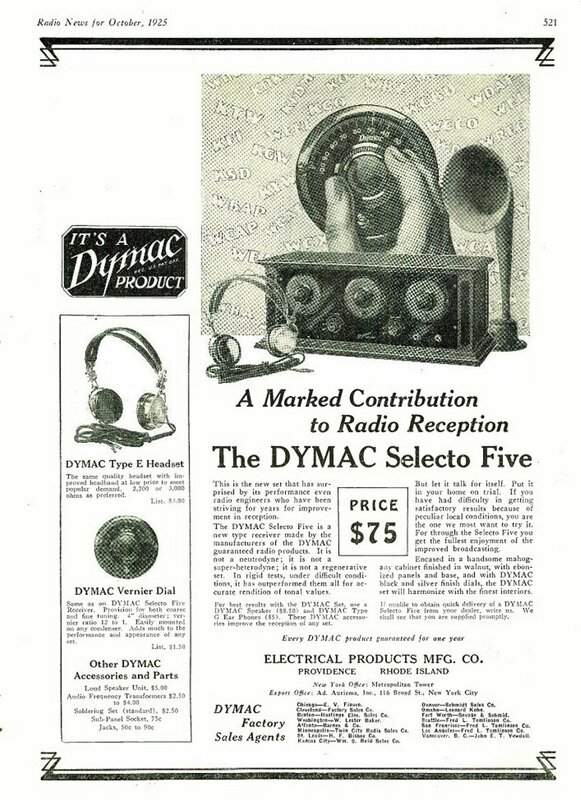 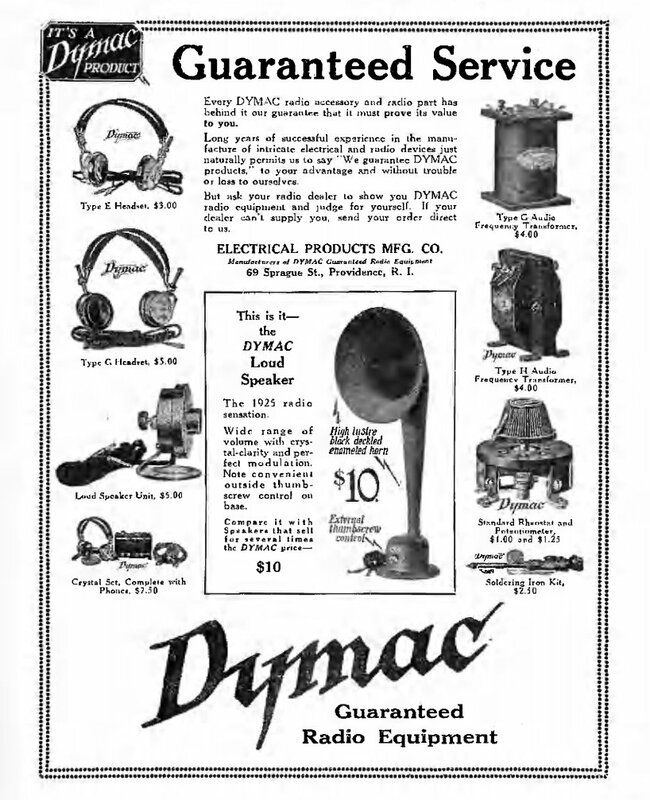 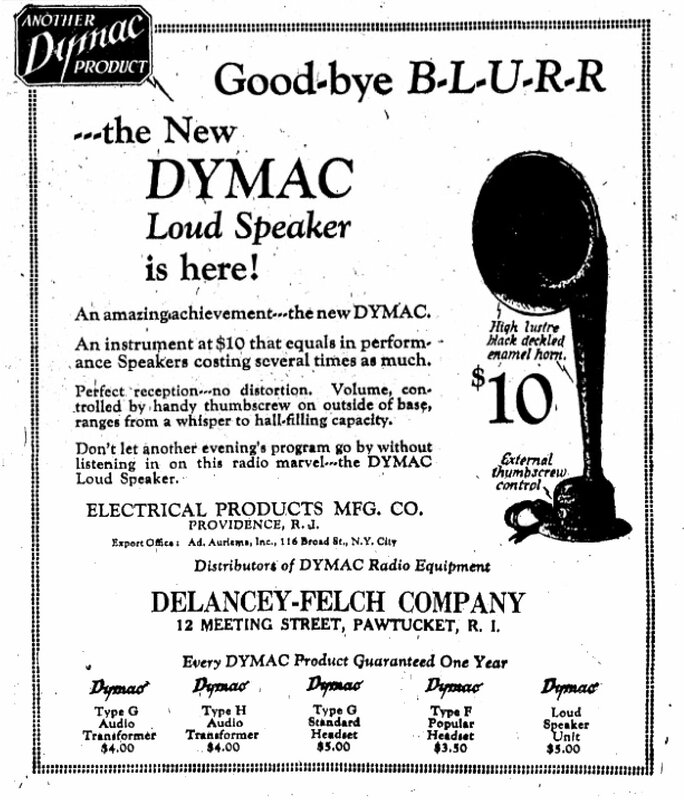 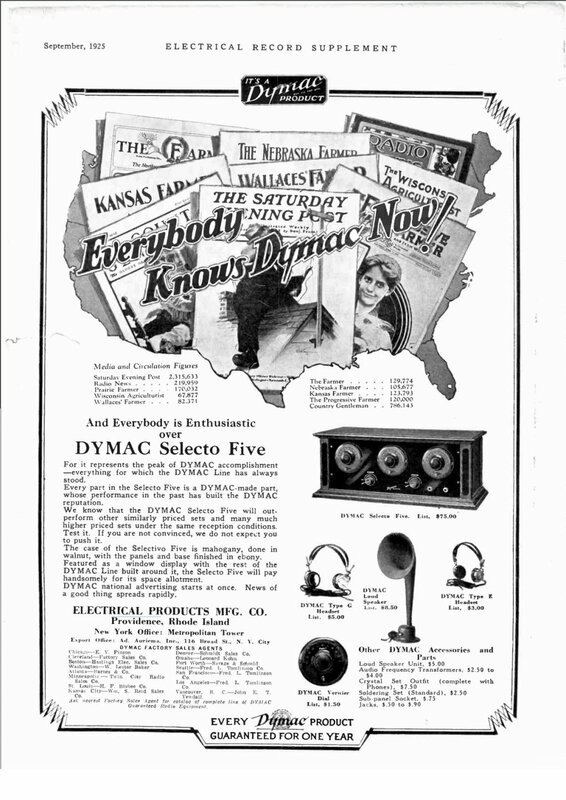 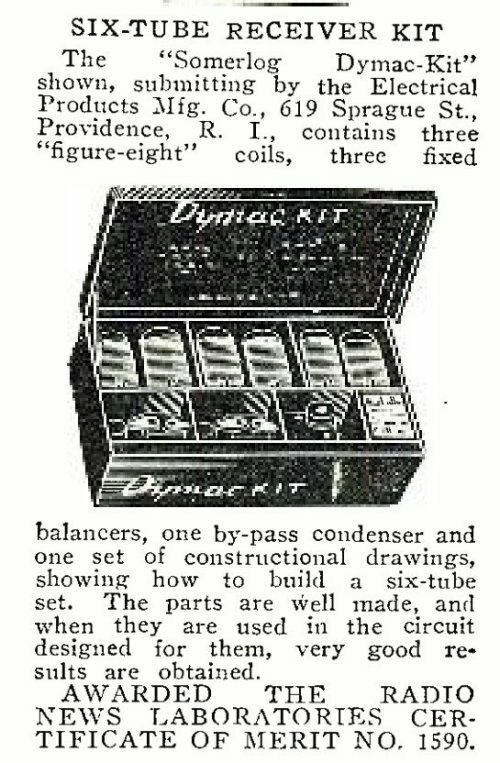 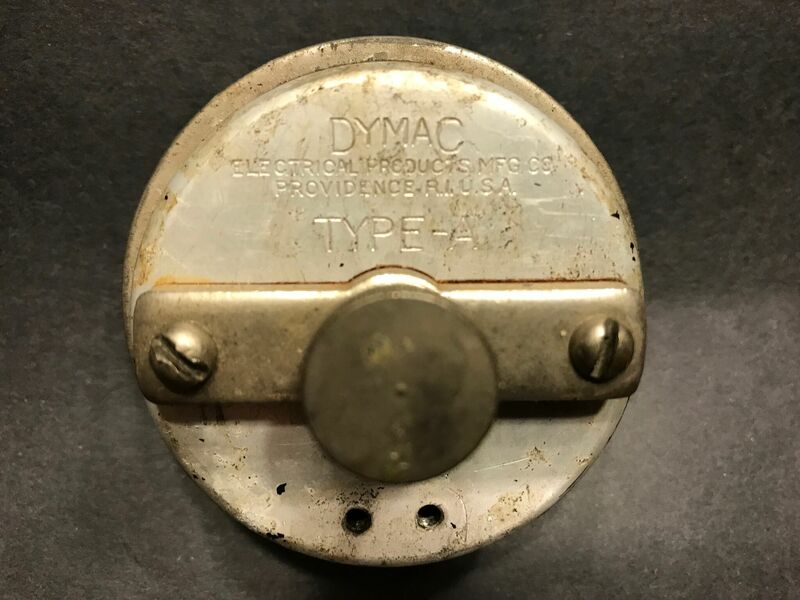 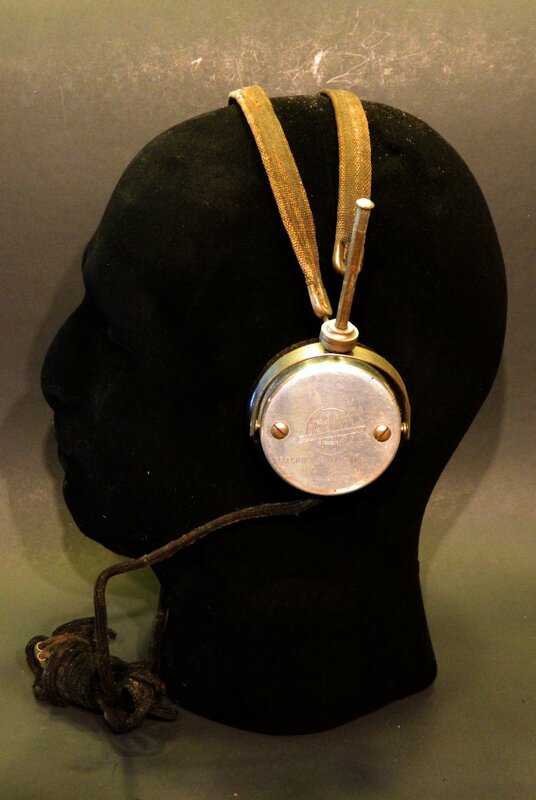 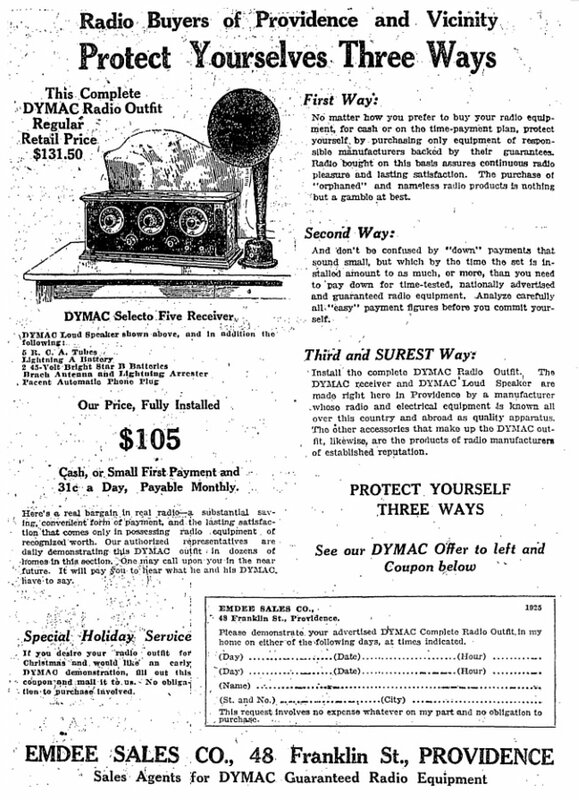 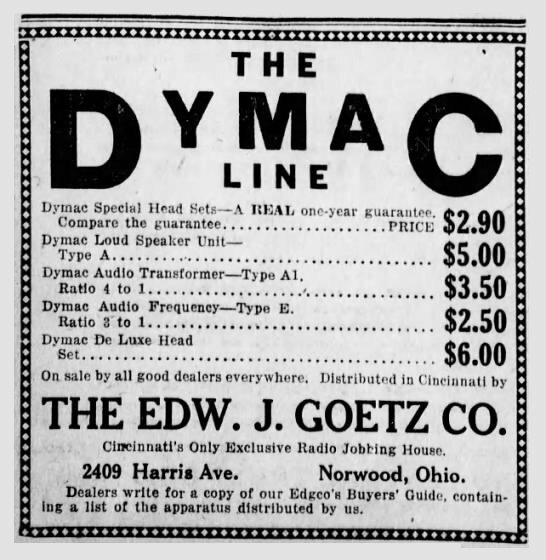 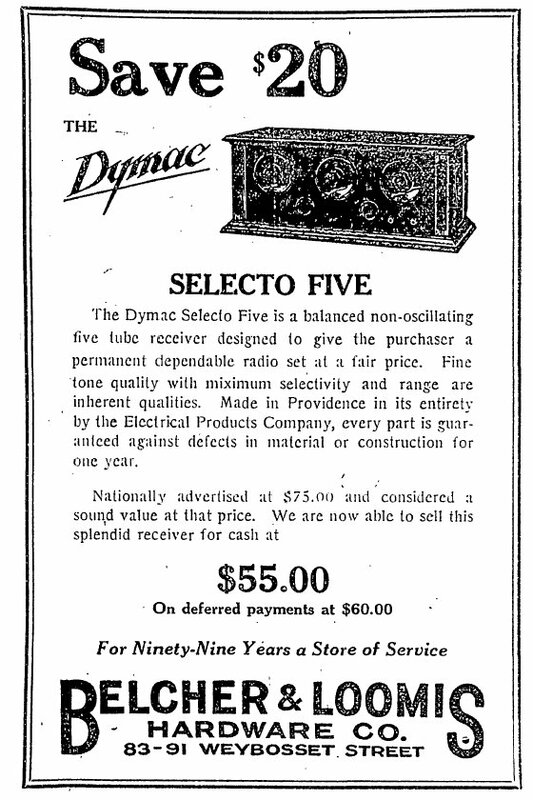 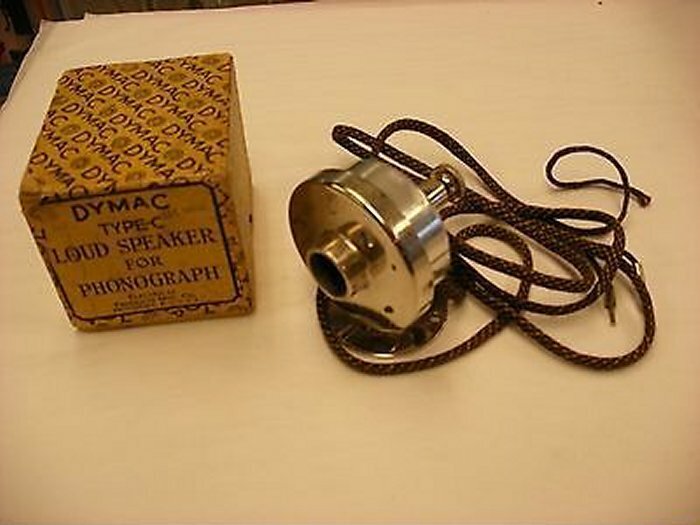 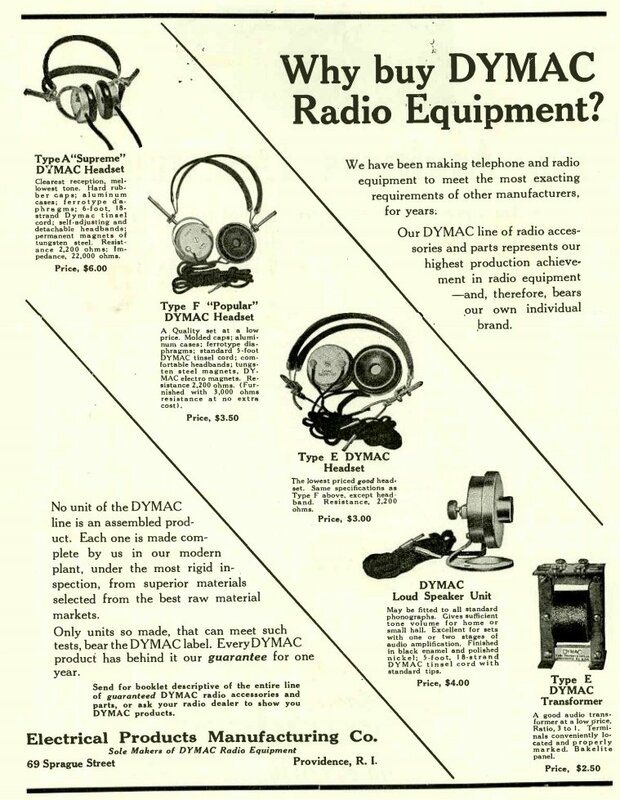 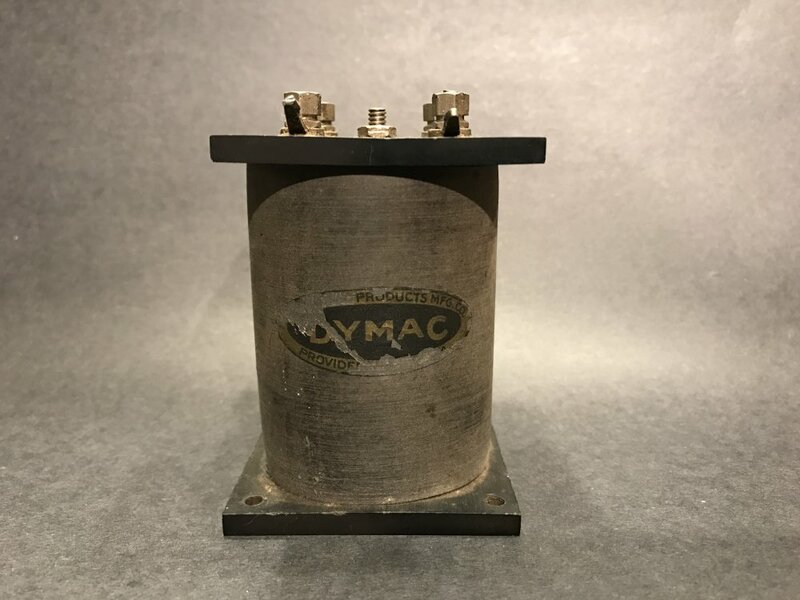 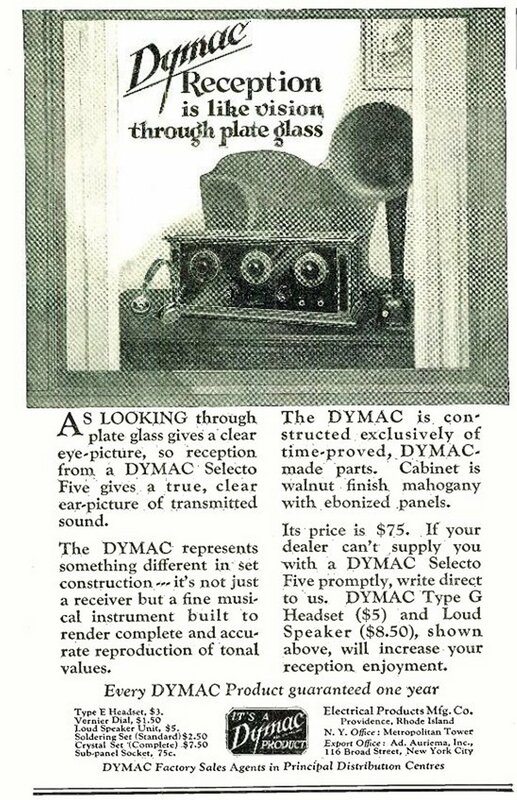 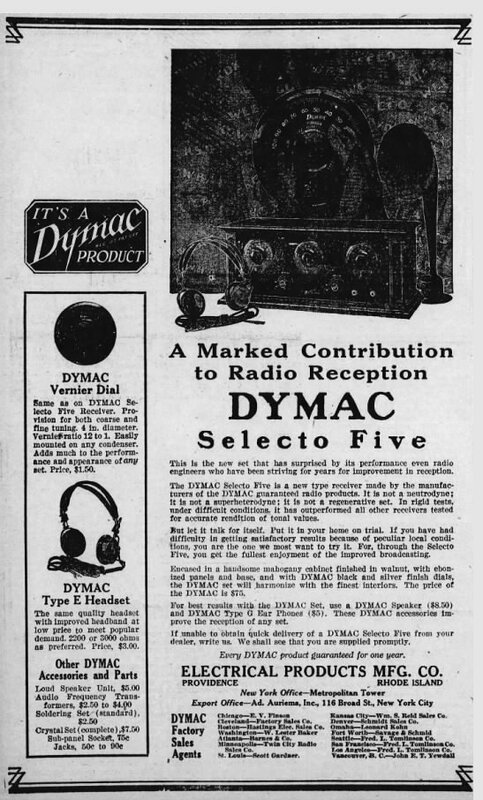 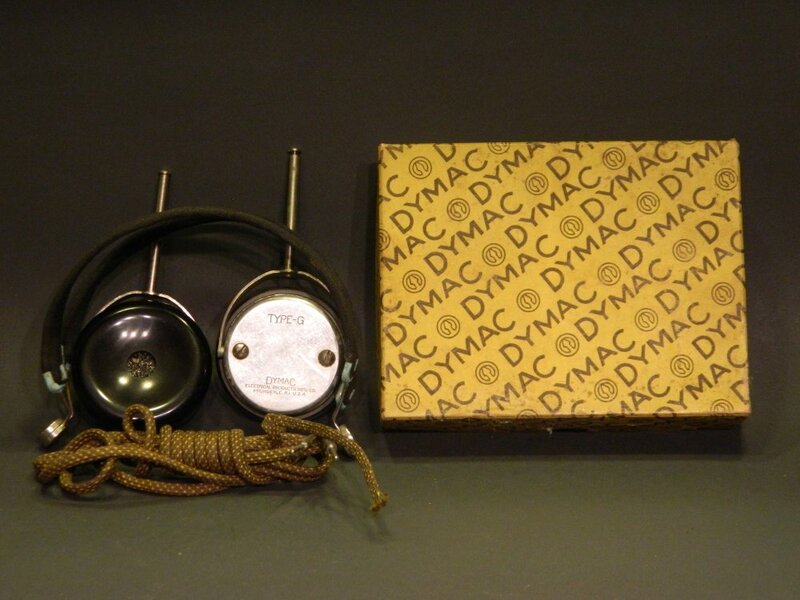 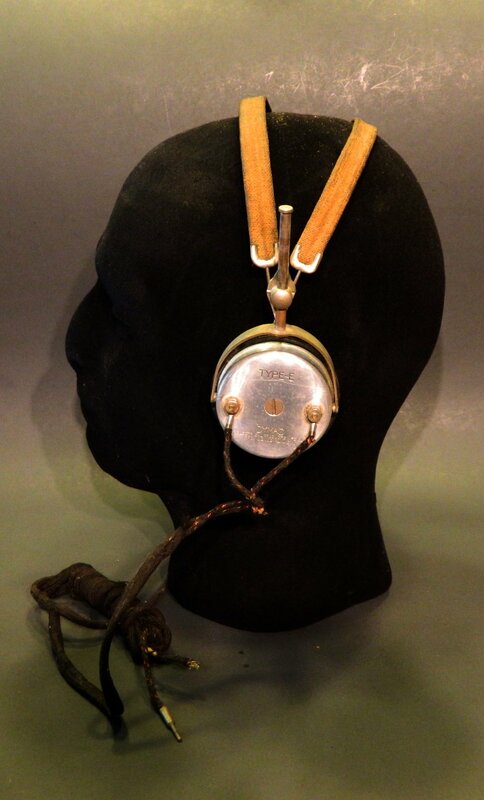 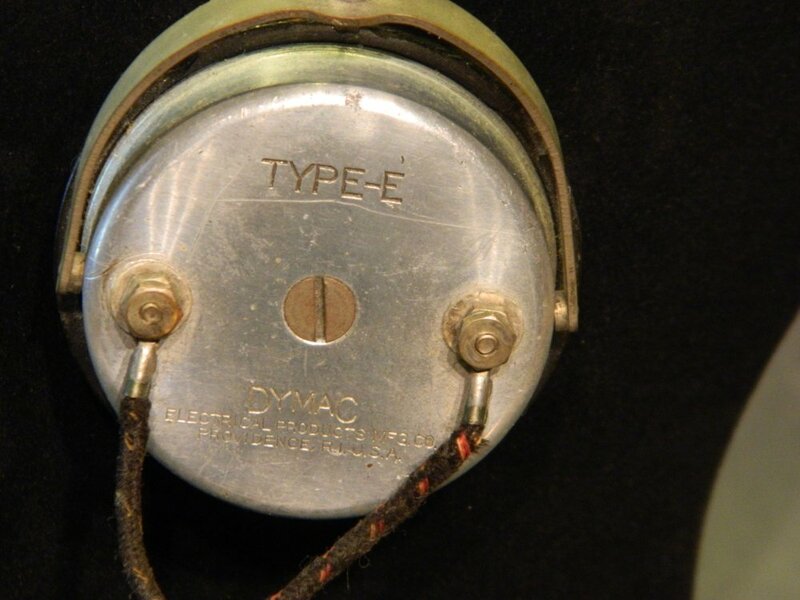 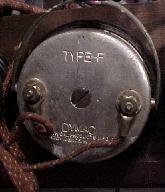 Dymac head sets types "F", "G" and "E"
Dymac audio-frequency transformers types "G", "H" and "E"
I know from their ads they made headphones, speakers and a 5 tube set called the selecto-five 12. 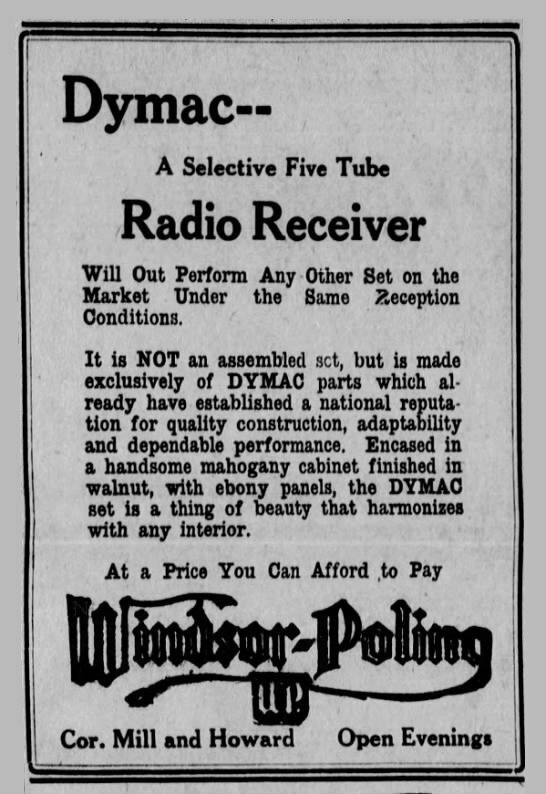 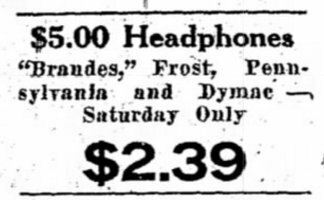 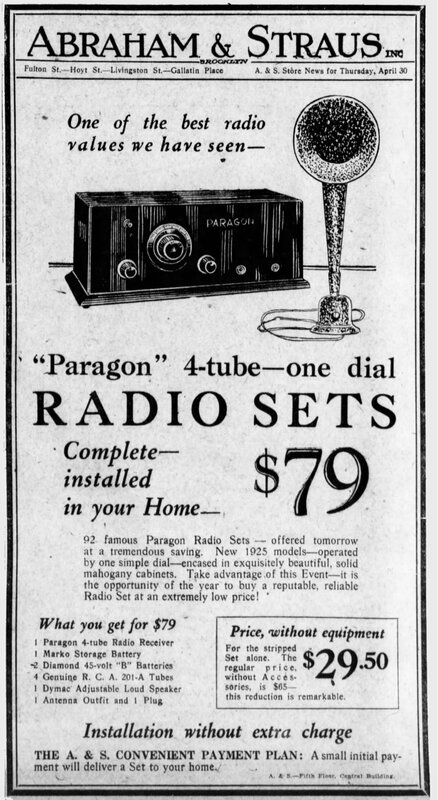 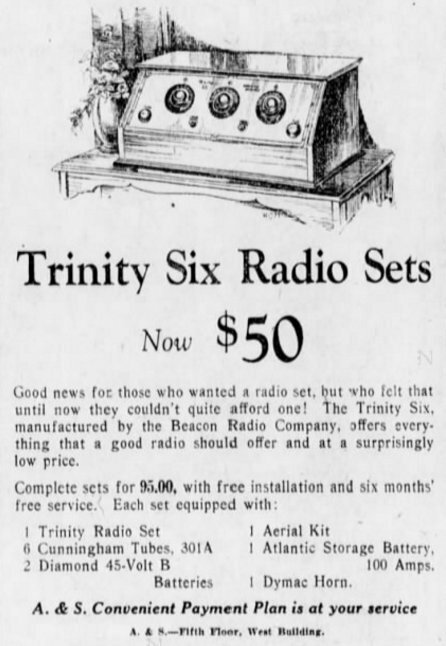 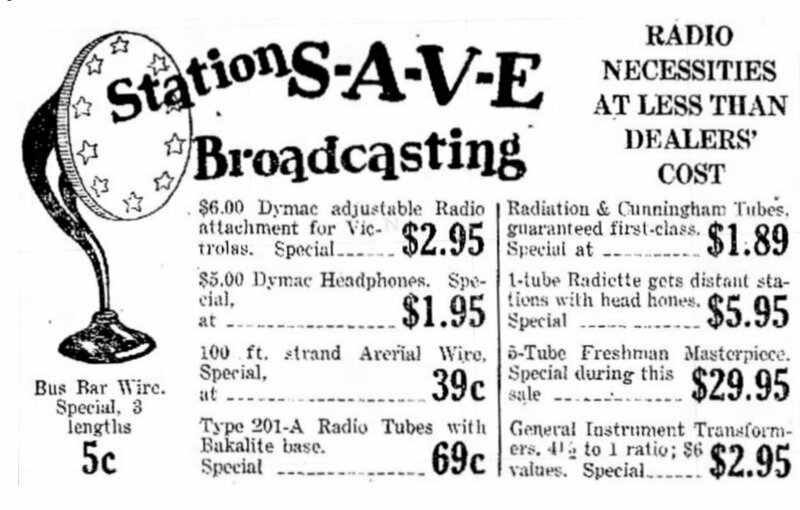 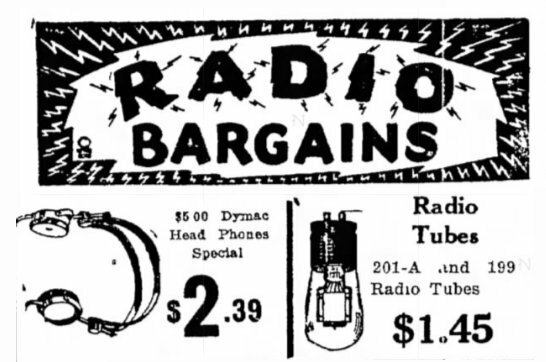 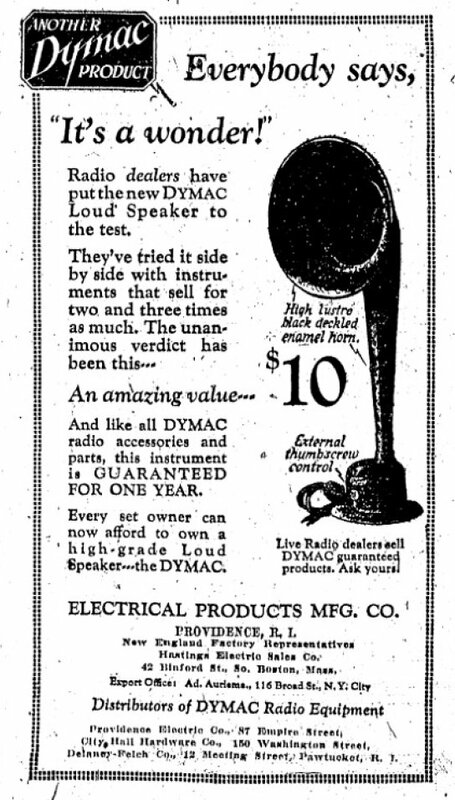 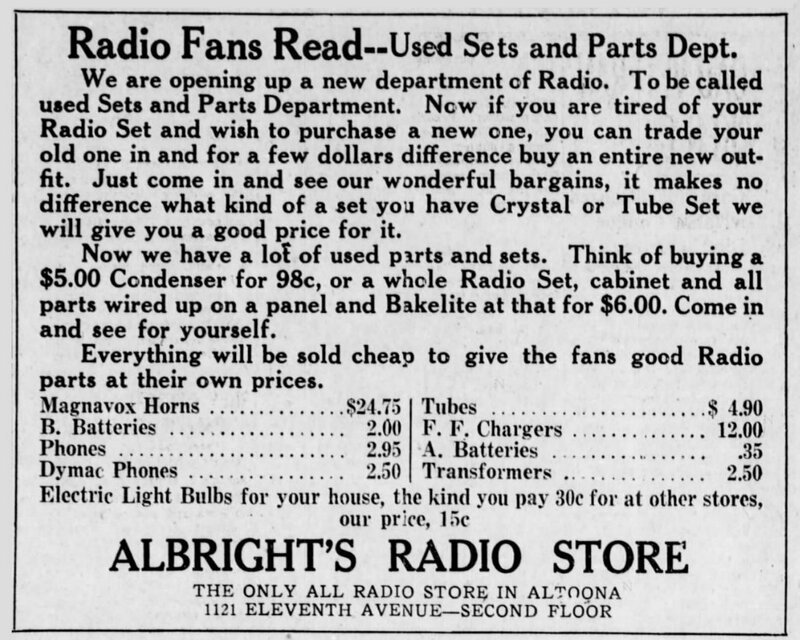 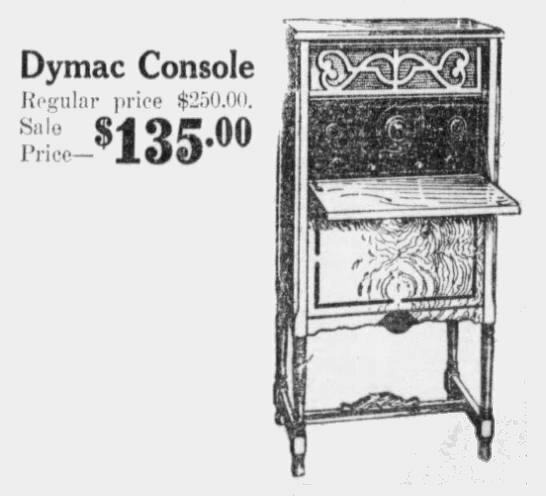 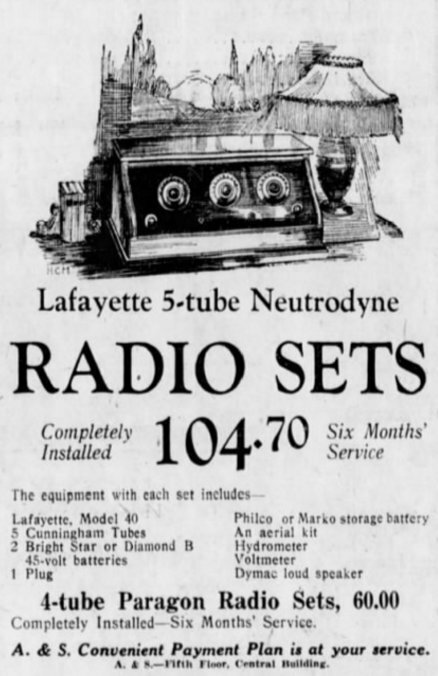 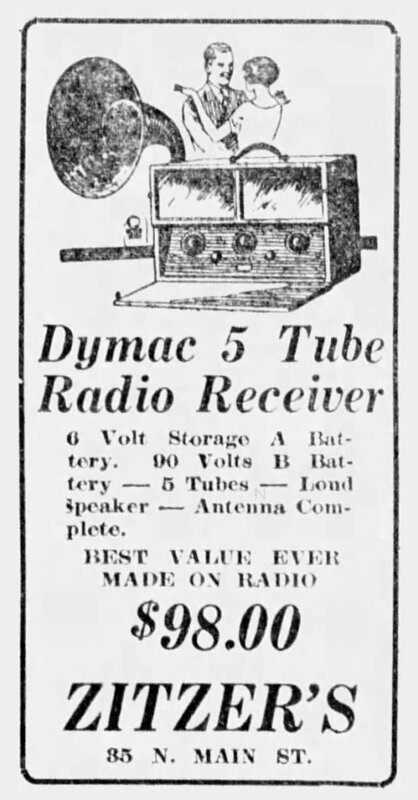 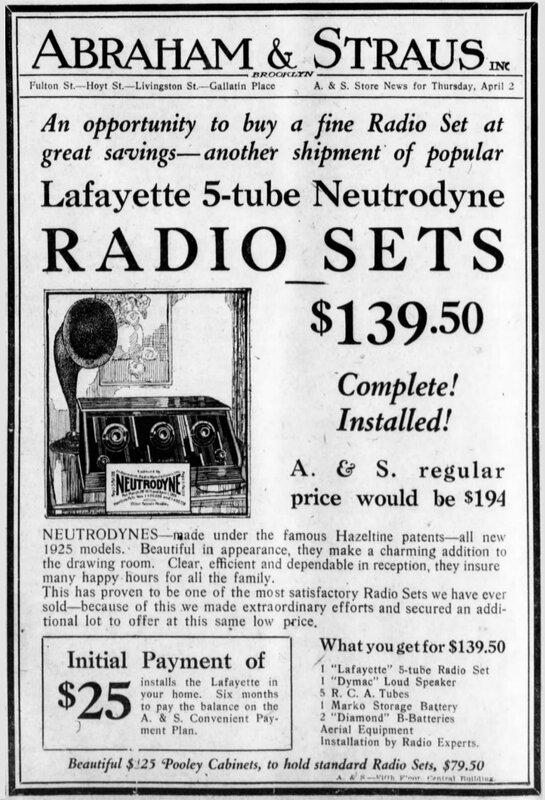 There is also an ad for a six-tube receiver kit. 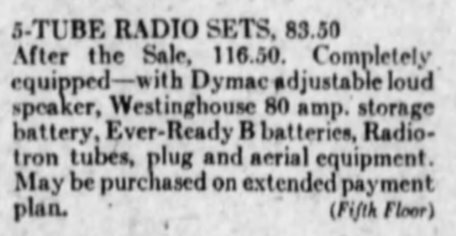 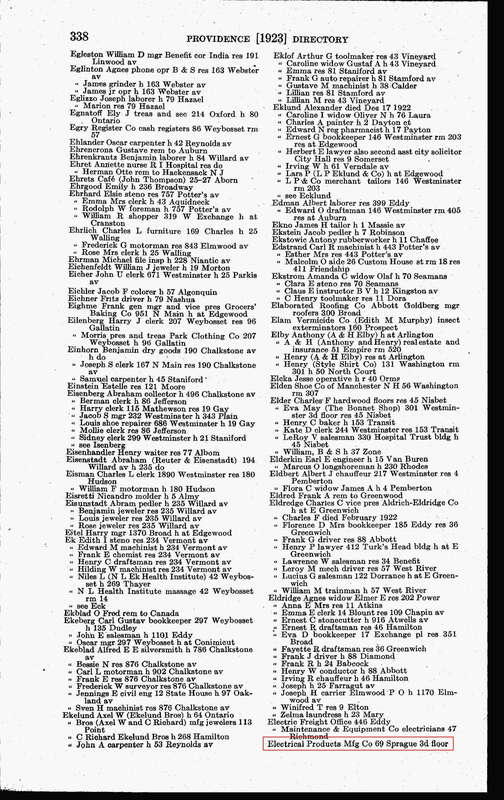 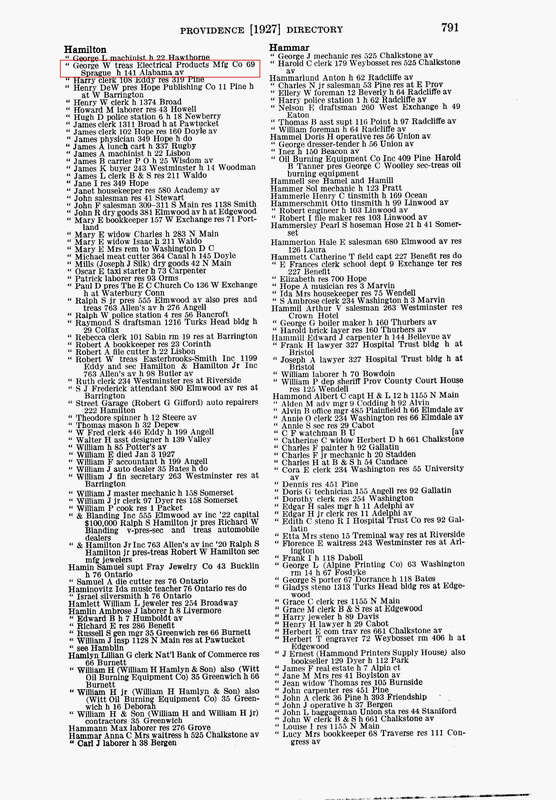 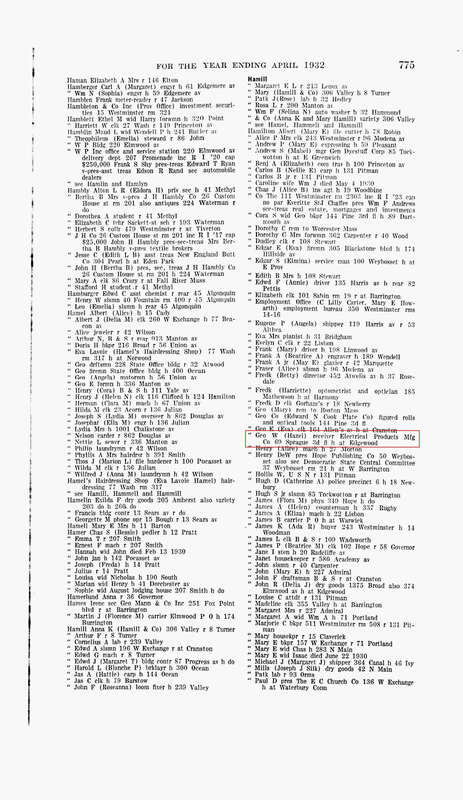 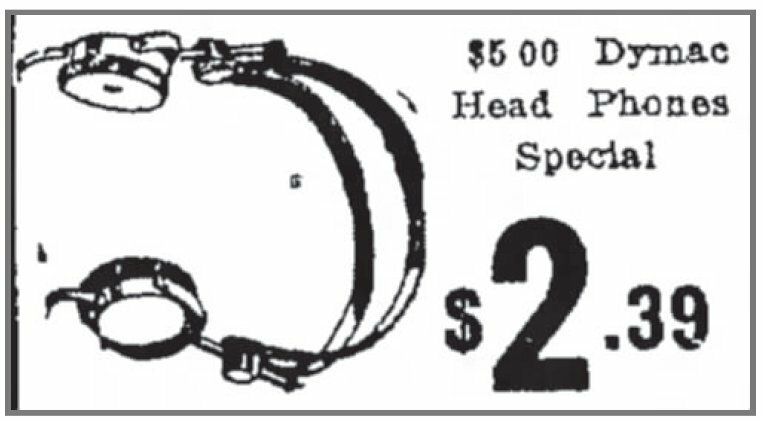 In the 1927 Providence Directory there is a listing for George W Hamilton as tresurer 7. 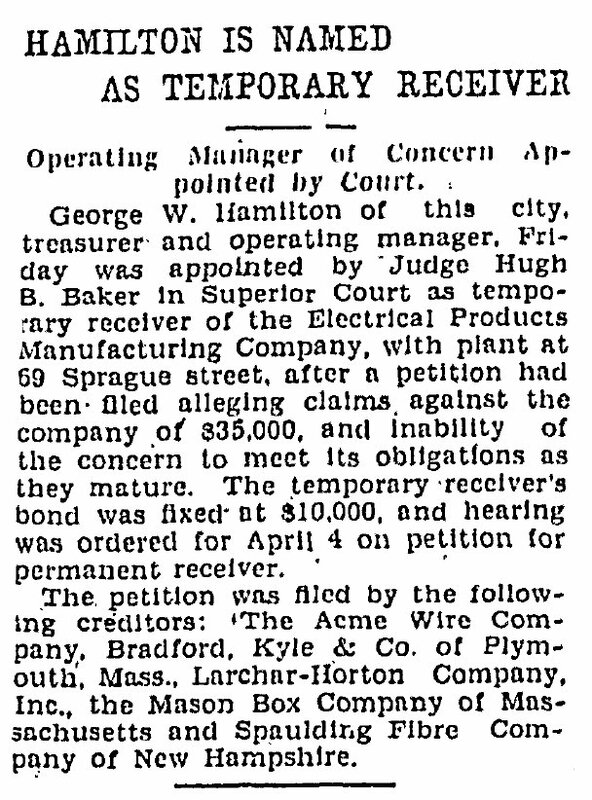 Hamilton becomes the temporary receiver of the company. 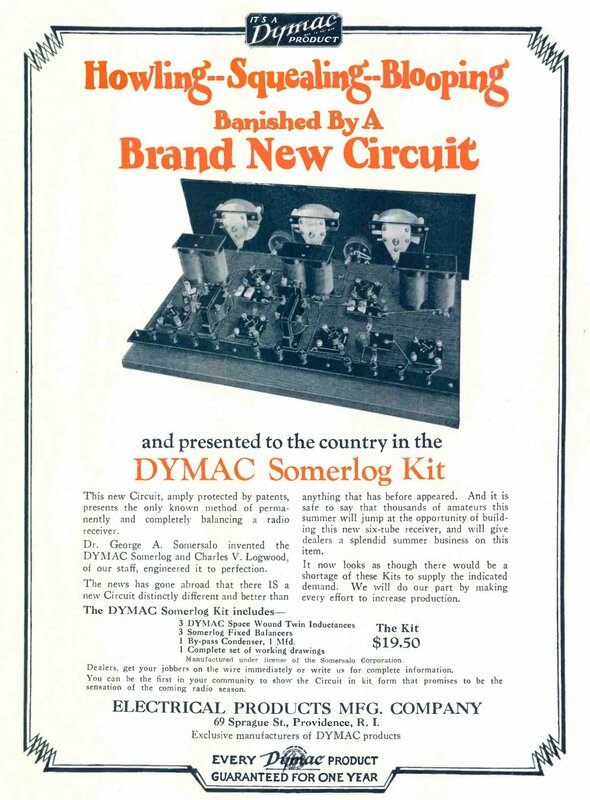 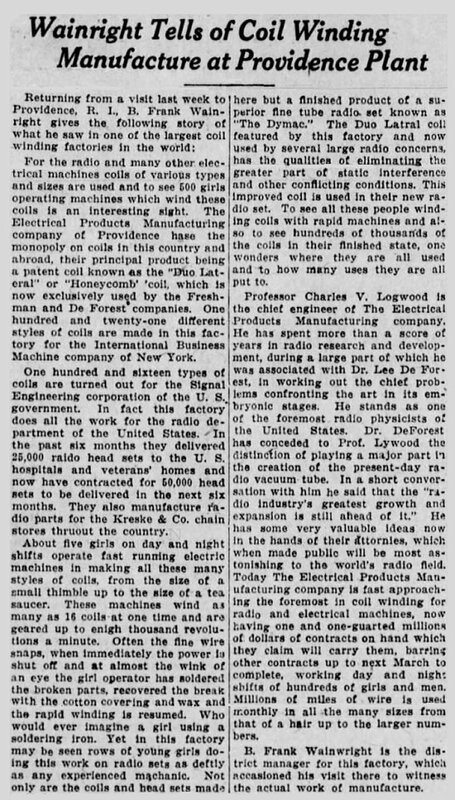 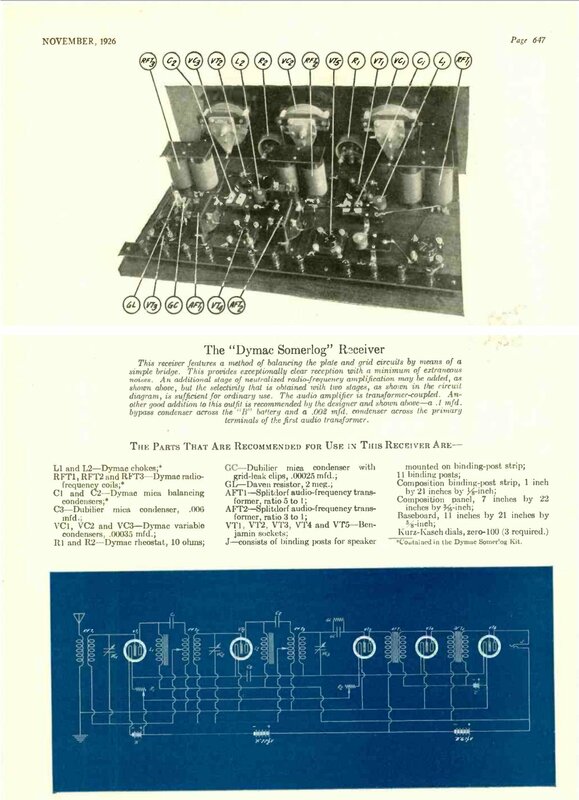 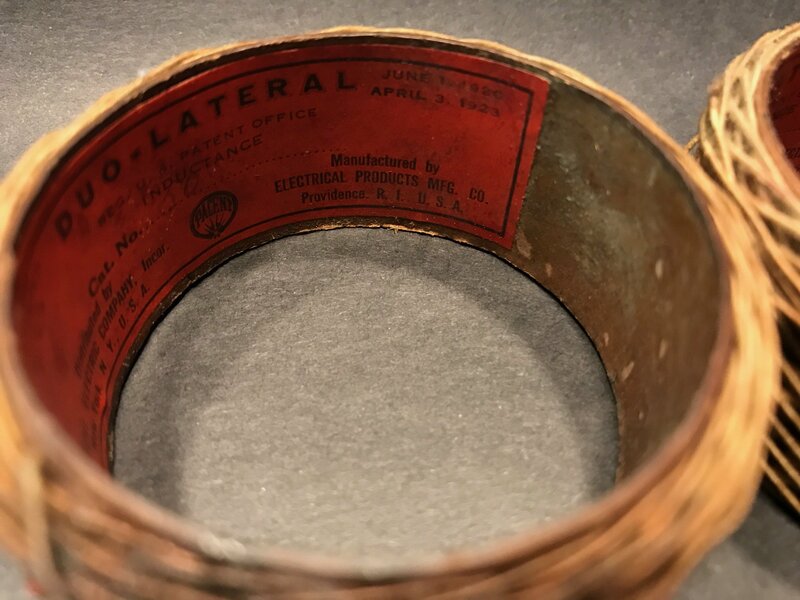 In 1928 the factory was turning out 116 coil types for the Signal Engineering Corporation of the U S Government. 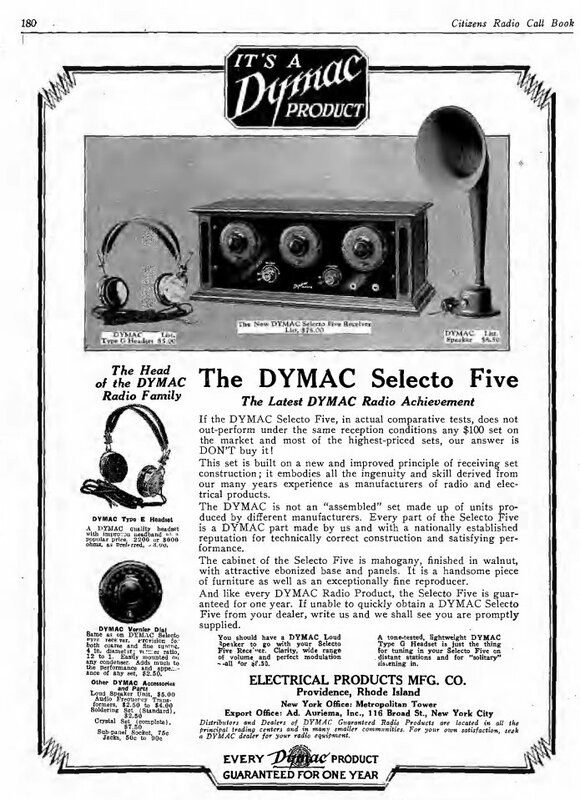 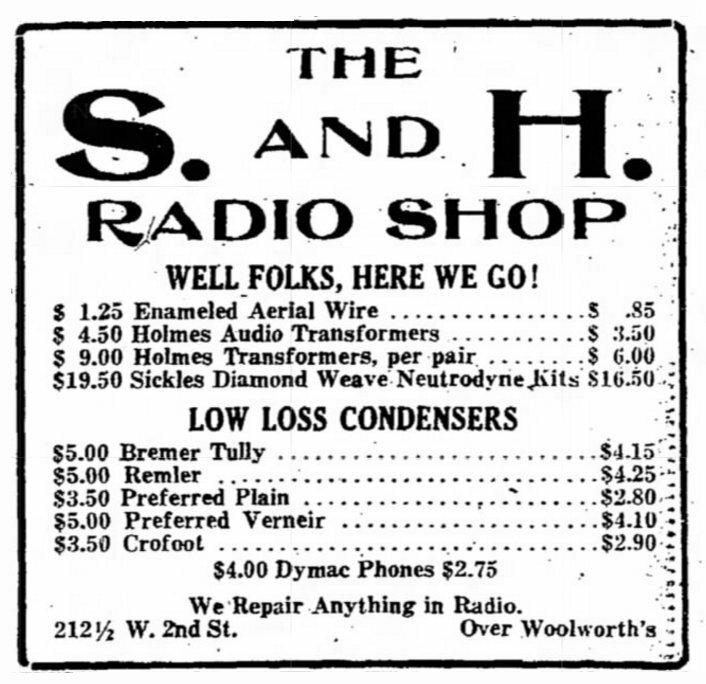 The factory did all the work for the radio department of the United States 13. 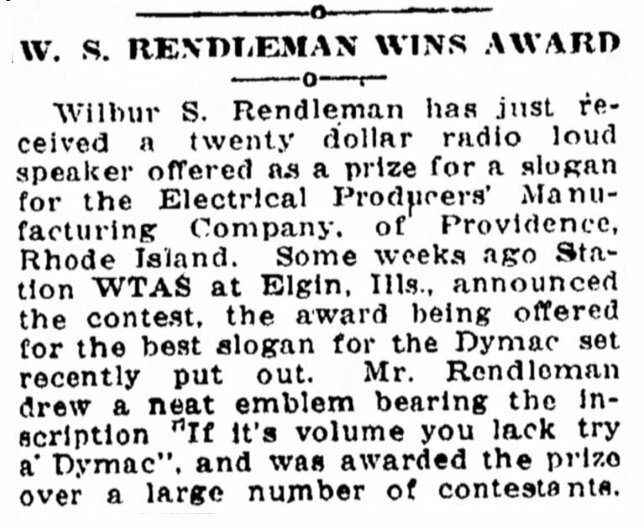 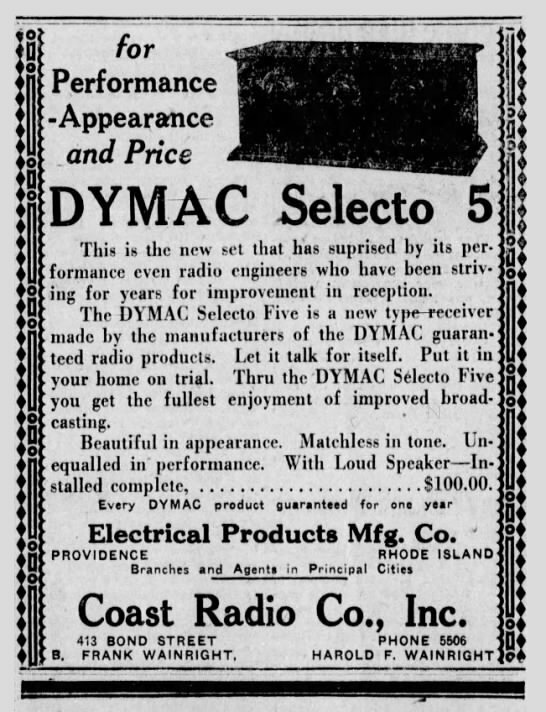 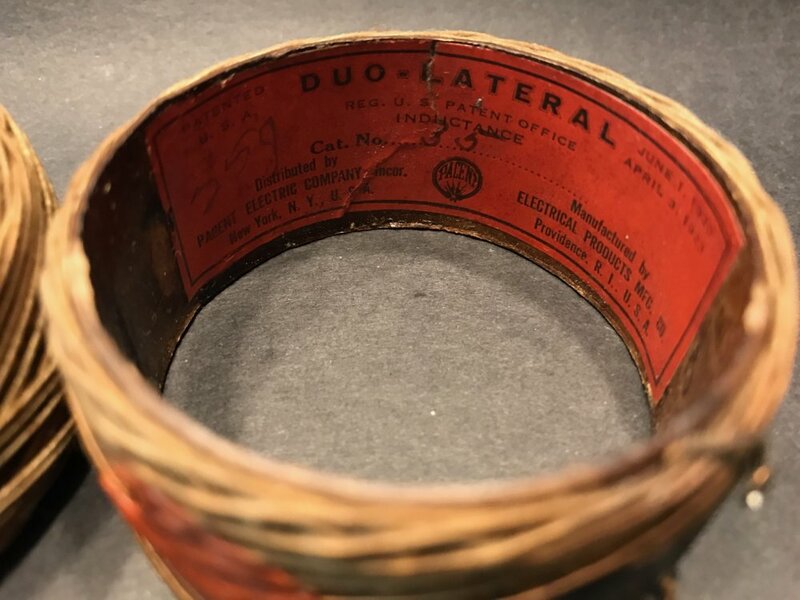 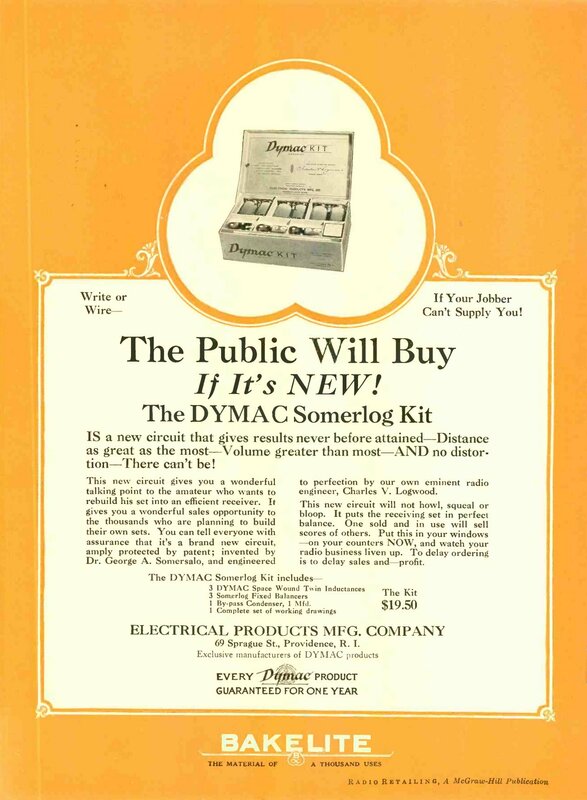 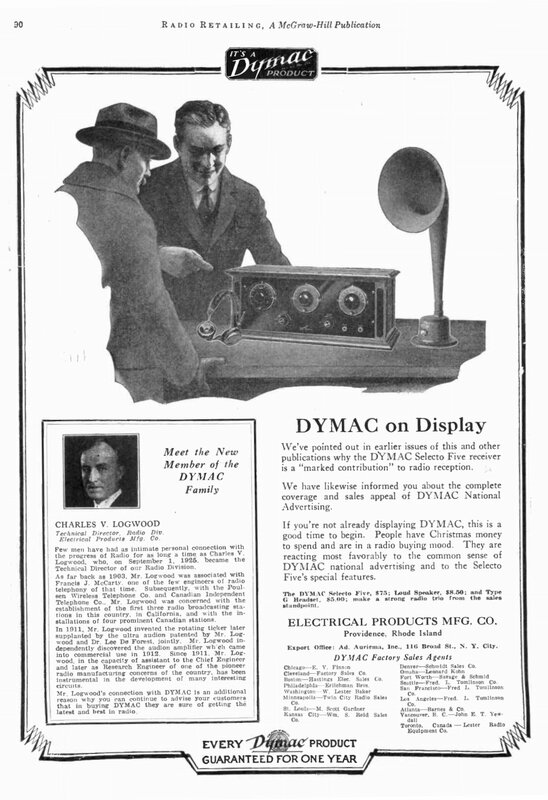 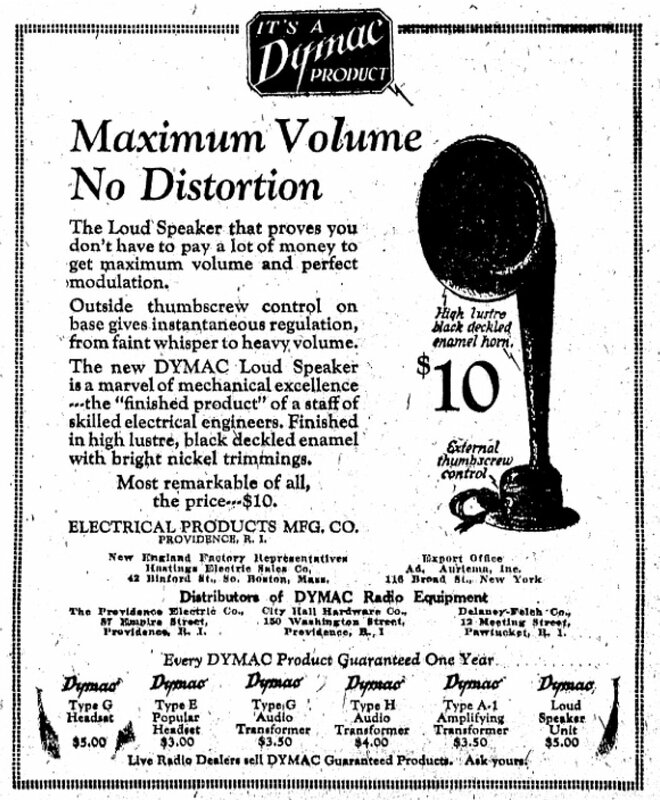 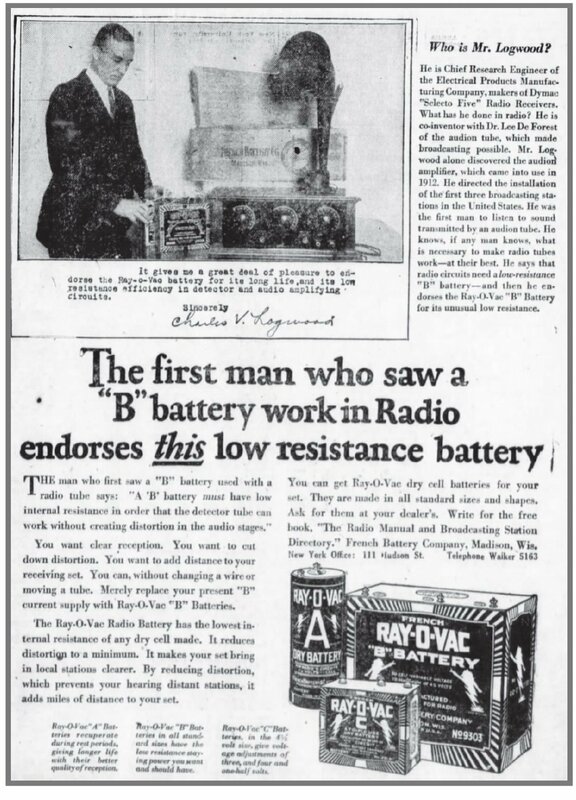 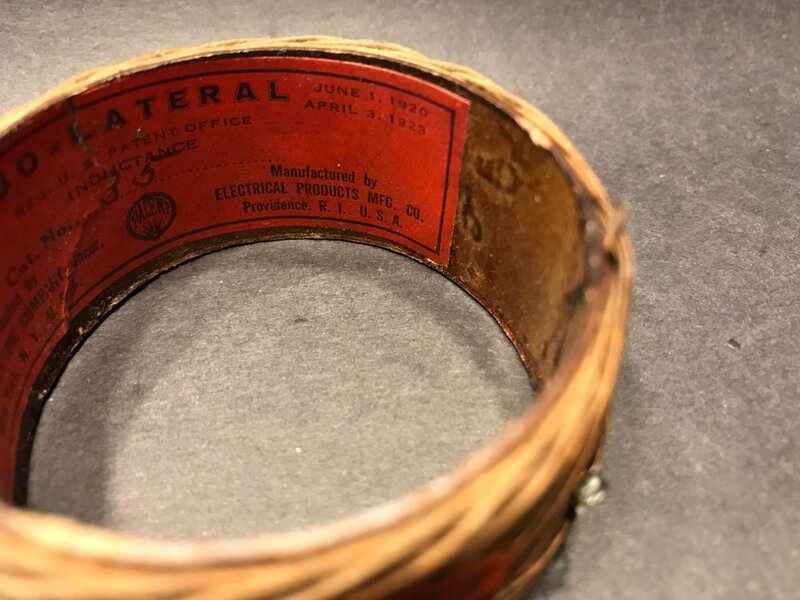 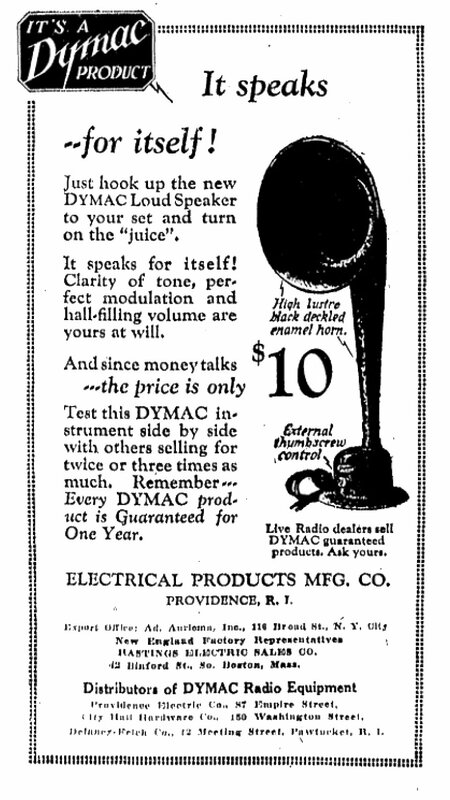 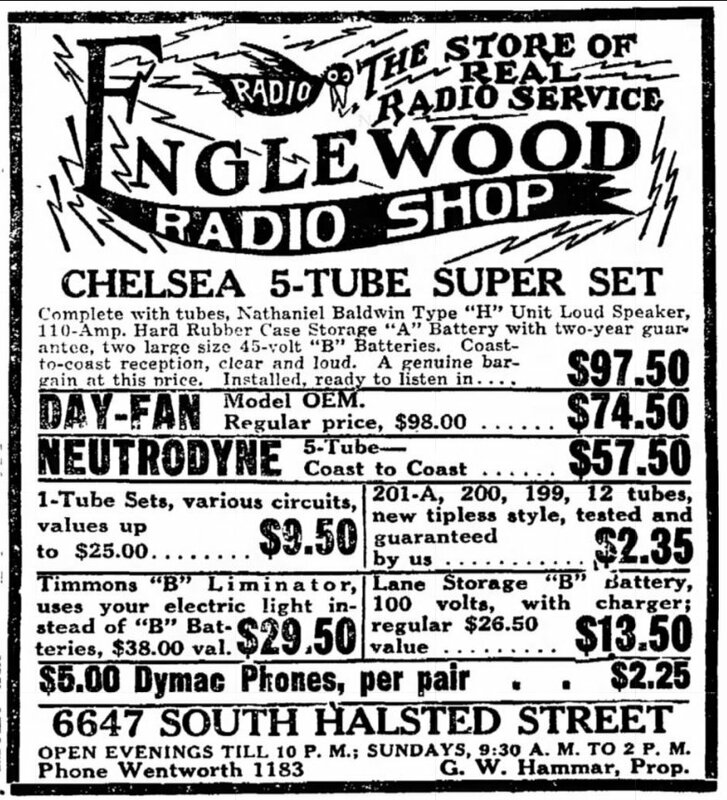 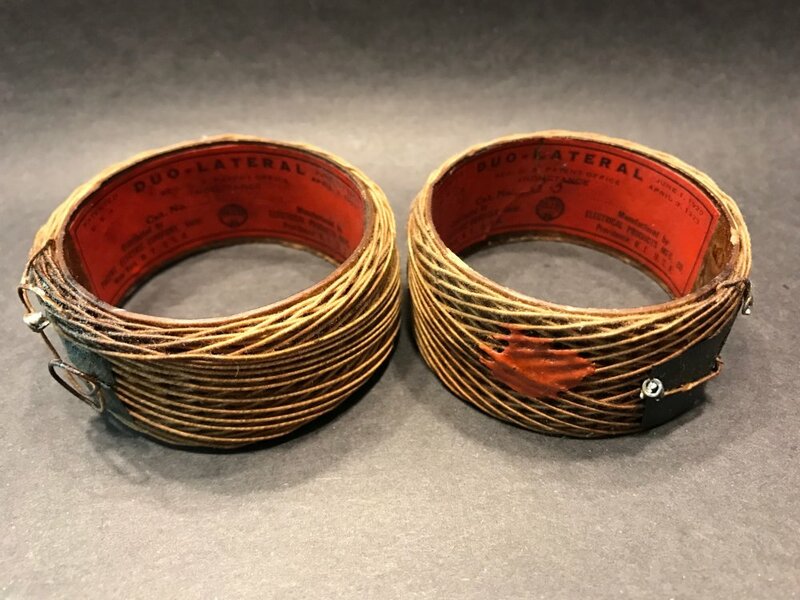 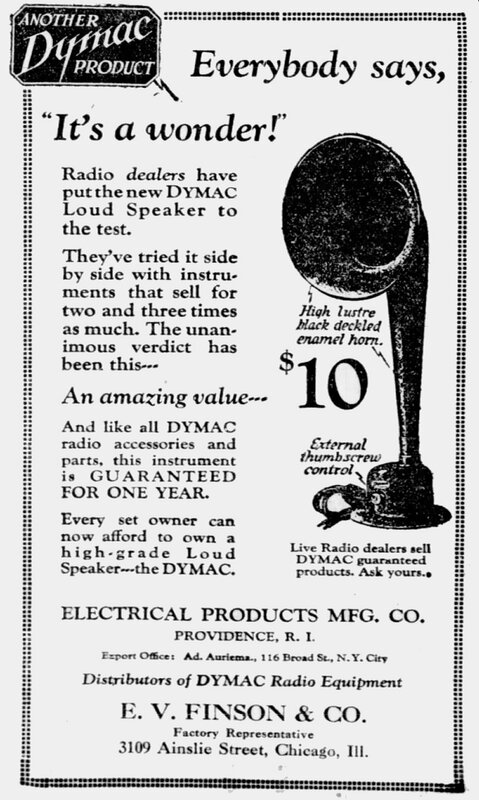 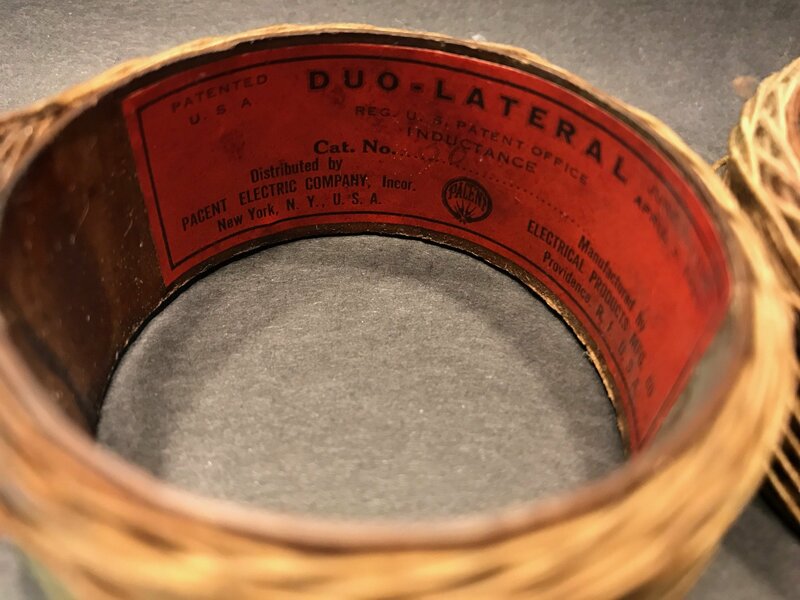 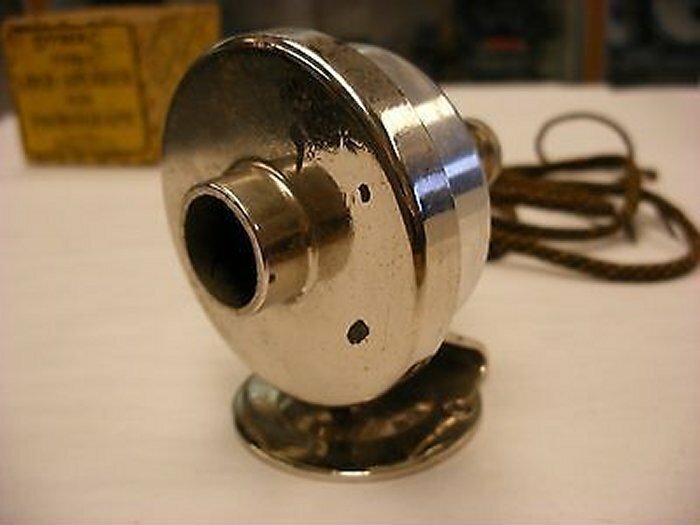 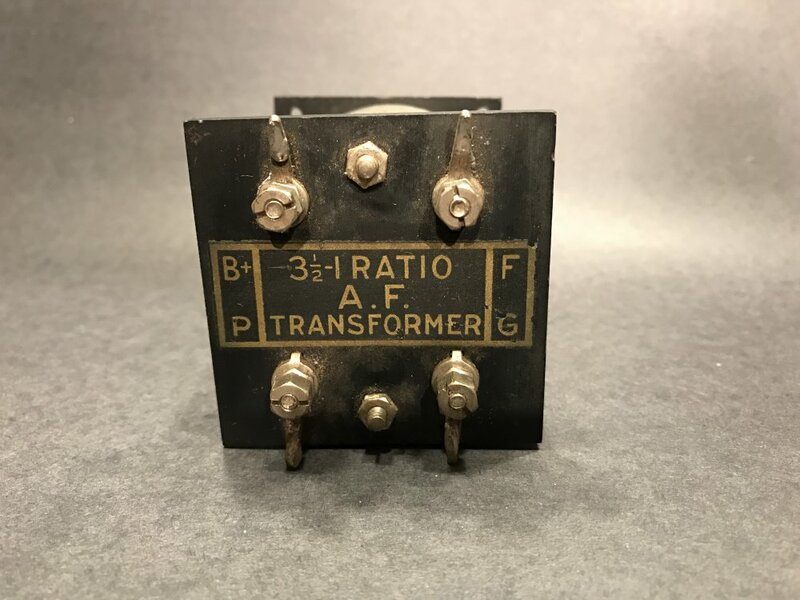 We find Electical Products Manufacutring Company still listed at 69 Sprague Street in 1929 8, and 1932 9 and then again in 1932 with the addition of George W Hamilton as the receiver 9. 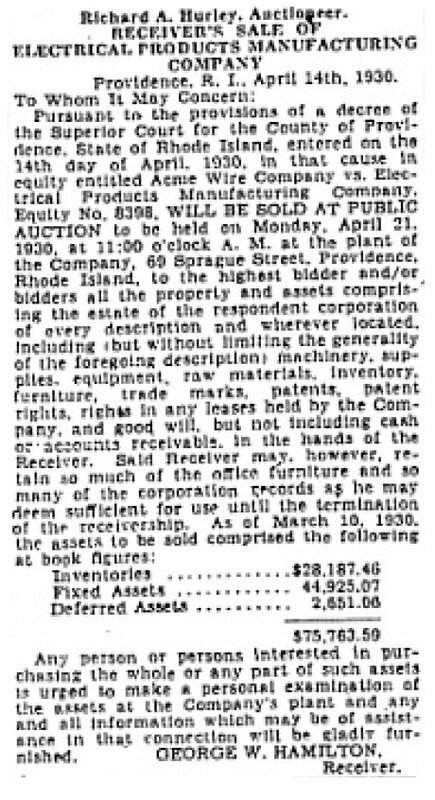 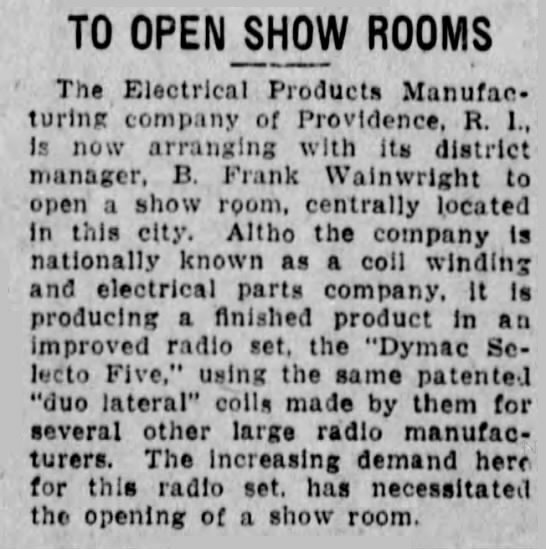 On January 4th 1930, there was a fire and Electical Products Manufacutring Company 1t 69 Sprague St in Providence. 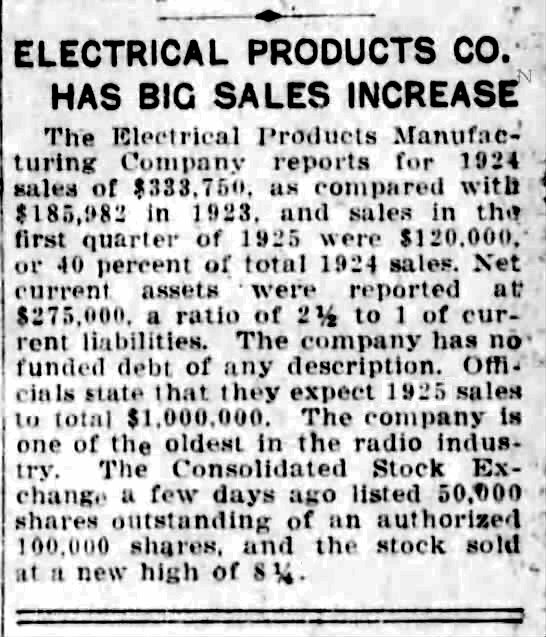 Fortunatly damage was slight. 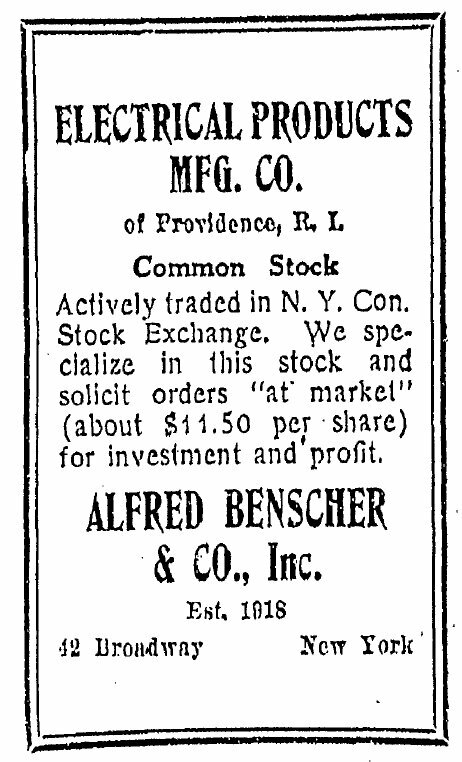 In 1938 we see one last mention of the company when the state posts that they have lost their Charter.